We had a long day ahead of us. 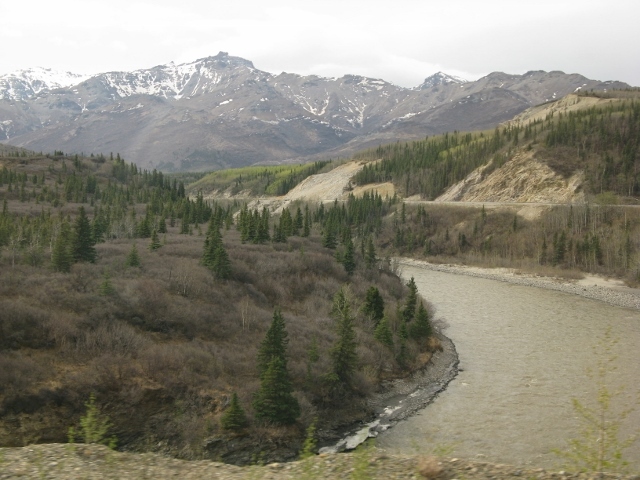 A 9-hr bus ride starting south on the Park Rd, then east on the Denali Highway (essentially mid Alaska to almost Canada), then south on the Richardson Highway to Princess' Copper River Lodge. Unlike other segments of our tour, our luggage came with us under the bus. 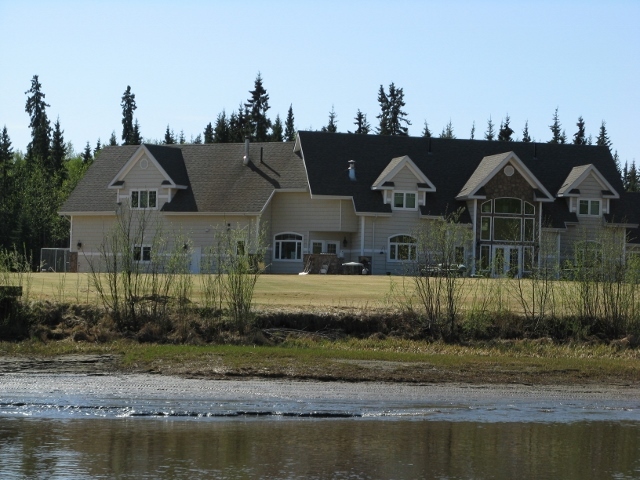 The Copper River Lodge does not have the traffic other lodges do and there is no need for a separate luggage truck. We were extremely fortunate with the weather. 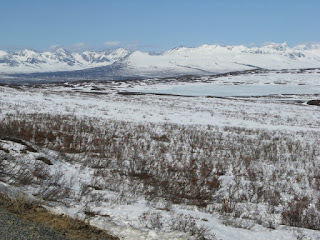 We had bright blue skies, moderate temperatures, and unbelievable visibility. Actually, our visibility was so great that part way through the trip our guide jumped up and yelled "That's Mt. Sanford!!! I didn't know you could see Mt. Sanford from here!" He was speechless, and this is after guiding for 20 years. So we lucked out. It could have been foggy, raining, snowing or any combination. 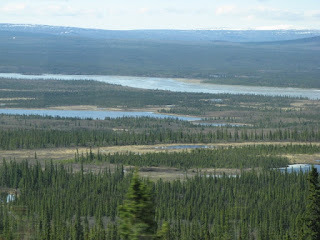 That said, I've included some photos here but they DO NOT do justice to this scenic drive. My husband and I have done scenic drives all over the U.S. and around the world and this has got to be among the top 5. I have only one negative to say about this day and that was lunch (not included). There was, literally, one place to stop for lunch and that was McClaren River Lodge. We realize this place is out in the middle of nowhere and it is hard and expensive to get supplies. That said, I don't think anyone was pleased with the lunch options. My suggestion is to have a huge breakfast at the lodge (included in our trip) and then bring out the granola and snack bars at the rest stop. 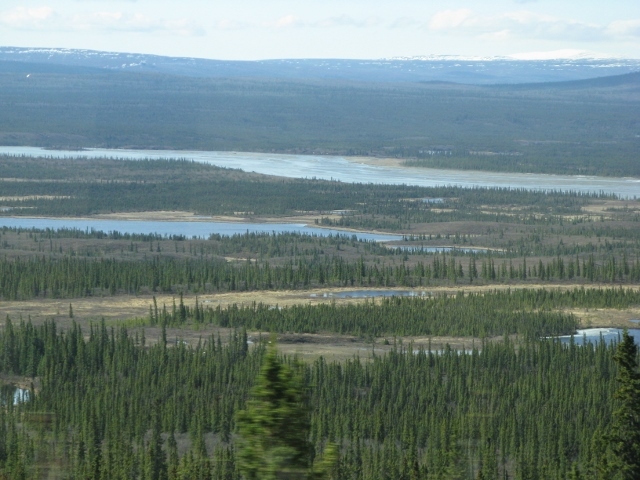 There are clean bathrooms and a small gift shop and the lodge is located on a glacial river, with the glacier very visible to us on this beautiful clear day ... a perfect place for more photos. We saw a lot of moose on our way and beautiful scenery although the overcast skies put a damper on our photos. The train ride was very comfortable. 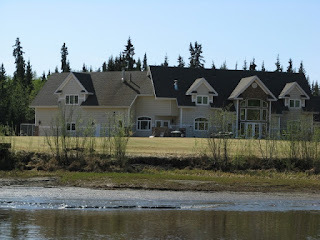 At the Denali Princess lodge our group had rooms in the two new buildings, set up on a hill. Between the buildings was an open area with rocking chairs and a third building with a lounge, coffee bar, and computers. Our buildings had elevators and our room faced the mountains. A small shuttle ran continually around the lodge grounds for anyone who didn't want to make the hike from one end to the other. 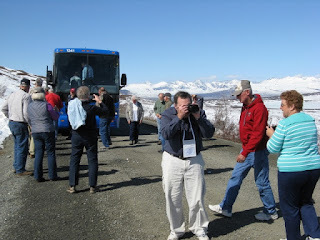 The next day, our full day in Denali, included a wildlife tour into the park. 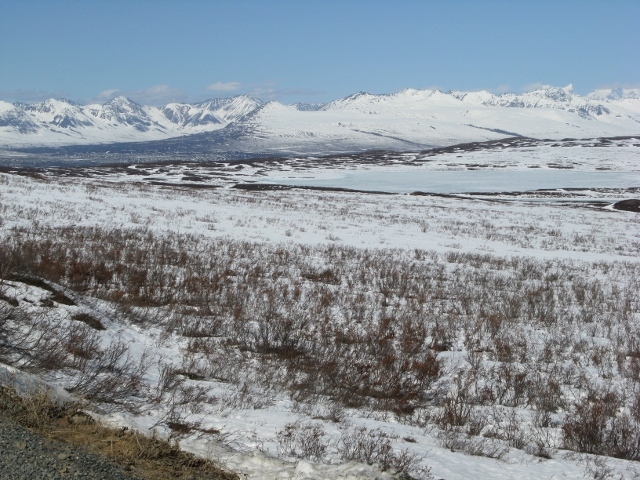 Our tour was suppose to include the Tundra Wilderness Tour which is a full day excursion. However, being so early in the season, the road was closed and we were on the Talkeetna tour. 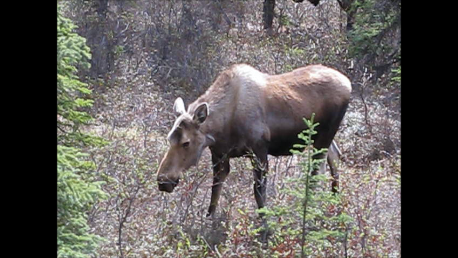 This was a half day excursion and we saw moose and caribou. Disappointingly, we saw no bears on our entire trip. 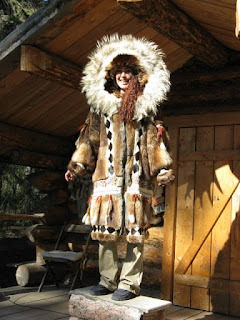 We had an option after our included tour: back to the lodge or dropped off at the Visitor's Center. We opted for the Visitor's Center and spent some time there plus had a snack at the nearby concession building. We then got on line for the 1:40 free park bus that would take us out to see the park sled dogs. The free demonstration was at 2 pm and they ran as many busses as necessary to get all interested viewers out there. We wanted an early bus because I knew the seating was limited and we wanted front row seats. Getting there early, DH claimed our seats while I wandered around the kennel. Most of the dogs were very friendly, rolling over to be petted. 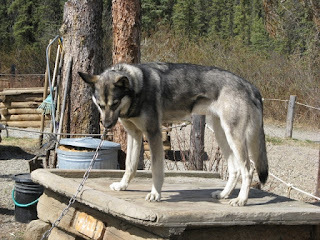 These, like all sled dogs, are Alaskan huskies. They are bred for personality, intelligence and the desire to please. During the winter, these dogs and the sleds are used to patrol the boundaries of the park. And this particular kennel breeds one litter a season. Unfortunately, we were a week too early to see the pups. Our lecture followed up with a demonstration of the dogs pulling a sled around a track. It was really interesting to see how excited the dogs got when they saw the harness being laid out ... it was kind of each of the dogs calling "ME! ME! Choose ME!" 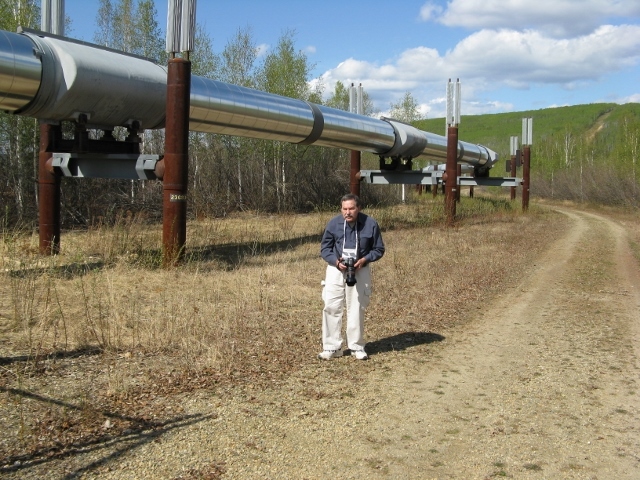 Fairbanks is a big little town. Our flight into Fairbanks was delayed so we didn't arrive until almost 12:30 a.m. For us, that was 4:30 a.m. body time .... just about the time we got up to start our travels. I thought it would be 'just a ride' but there was a lot of narration and a lot of information. Arrangements were made for a flight plane to take off and land. We learned about sled dogs from the kennel we passed (people on the shore with mics) and the local Native Americans from a "village" along the shoreline. We stopped at the village for talks at various locations in the area. Learned about their lives, hunting and fishing, and clothing they made, including this gorgeous jacket .... said to be worth $60,000! I was also very impressed by some of the houses we saw along the waterfront. Back at the dock, lunch was waiting for us. It was served family style and included salad, roasted vegetables and stew, water and iced tea, and dessert. I took time out to hit the gift shop which, in the end, I feel was one of the best ones we saw, for price/quality. 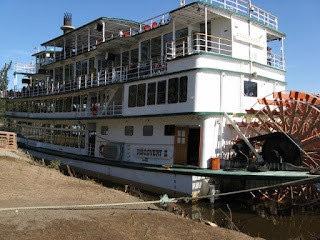 The afternoon took us to an old gold dredge. 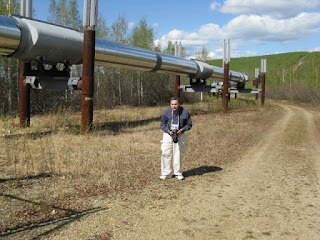 I found most interesting the fact that we got up close and personal to part of the Alaska pipe line. 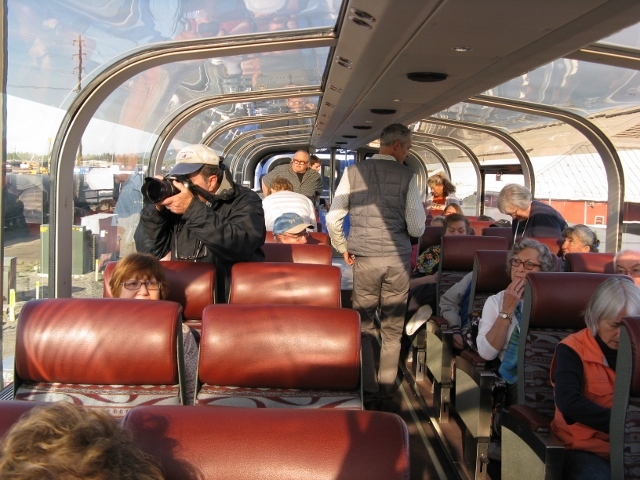 We then got into a small train to be taken about the gold area. 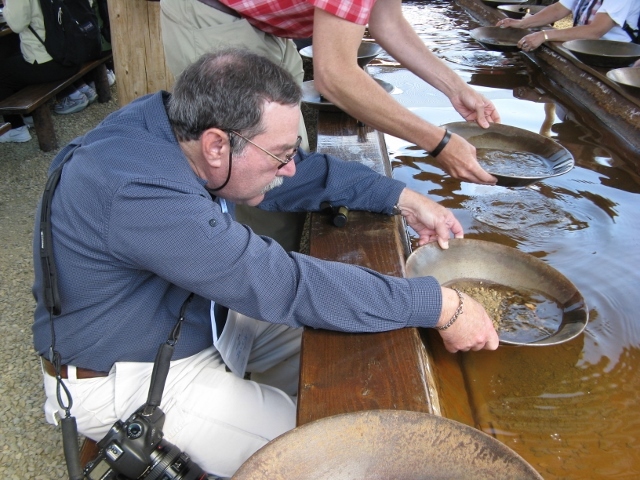 We learned about dredging and all got a chance to pan for gold. It was fun. And no, we didn't find much between the two of us.